A 50 yo female with a known sellar para sellar tumor in previous CT. MRI performed for further evaluation and follow up imaging. On clinical examination multiple left sided cranial nerve palsies. Axial T1w and Coronal T2w image show a sellar left para sellar well circumscribed mass lesion obliterating left cavernous sinus, encasing left ICA. 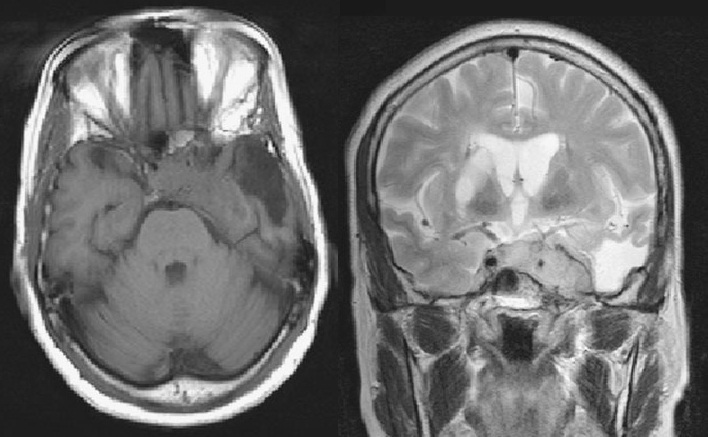 Lesion is iso intense to cortical Grey matter on T1 and T2 images. Homogenous enhancement on axial and coronal post contrast T1w images. Encased Left ICA narrowed. Lesion is extending in sellar and supra sellar region. Left temporal lobe Gliosis as an e/o previous attempt of excision / biopsy. Radiological and Histopathological Diagnosis: Cavernous sinus Meningioma encasing ICA. 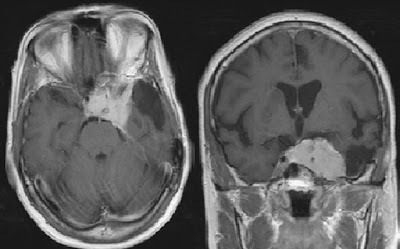 A meningioma that originates in the cavernous sinus can invade the sella. 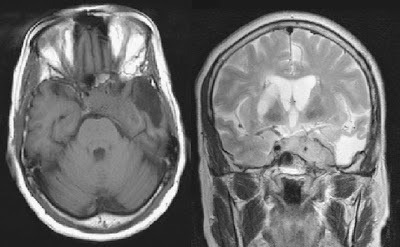 Meningiomas classically encase and narrow vessels while a pituitary adenoma would not. Cavernous sinus Meningiomas that encase and narrow the carotid artery are difficult to resect surgically or completely non resectable. Obliteration of left sided cavernous sinus explains multiple cranial nerve palsies namely 3rd 4th and 6th CN traversing left side cavernous sinus.